Tessa Broad – The thoughts and ramblings of Tessa Broad, writer. Many years ago I wrote a letter to the children of my imagination, the family that I had nurtured in my head that wasn’t to be. It was a gushy missive, all hearts and flowers but I felt it was cathartic for me at a time when I was on the cusp of accepting my lot as a childless woman. 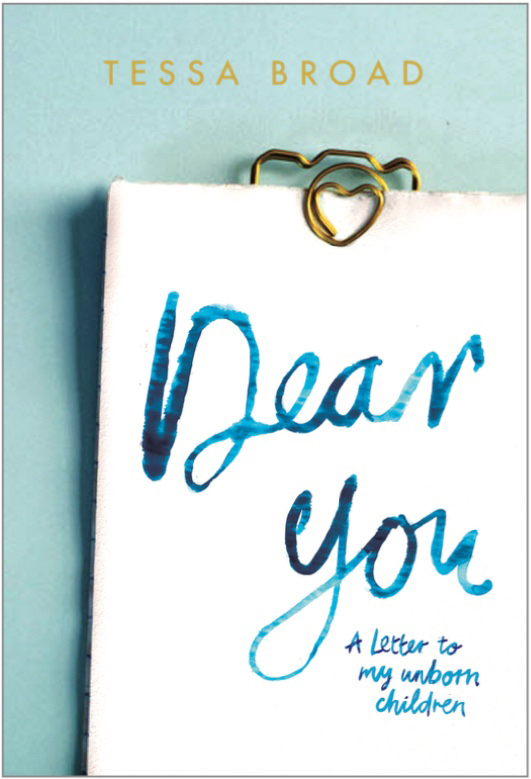 I have since written a second letter, a very much longer letter, which has been published as Dear You: A Letter to my Unborn Children. This website is an extension of the letter. I will post observations, pearls of wisdom (?! ), must-have purchases, triumphs of any sort, retail, personal, baking or gardening related. It is a platform for me to carry on this ‘conversation’ with my unborn children – of course they won’t be able to answer back – so that has its advantages. There are also things I’d like to share with the world in general and of course the world in general can answer back. I hope you will be kind to me. PS. I will post random reviews on places, products, books and ‘stuff’ in general. They will just be things I like or admire not things I’ve been paid to write about. I think it always feels good to dish out some praise. It feels like such a positive thing to do. The word random is key here; there will be no rhyme nor reason why anything appears. It will be just on a whim; I like this place, this gadget, this shop, or this place to eat. From time to time I might also include a gripping TV drama, or an inspirational novel or affecting film. The word random applies here too. Here I will share things that give me joy; things I have recently acquired and things I have had for years; things I have been given, things I have bought, things that were bargains and things that were not; things I use daily and things that just make me smile. They will all be pieces of me and precious to me in some way. With Mother’s Day fast approaching I think it’s time for a shout out to those among us who find Mothering Sunday less than straightforward.